Manganese (Mn) (atomic number 25 and atomic weight 54.93) has density of 7.44 gm/cc. 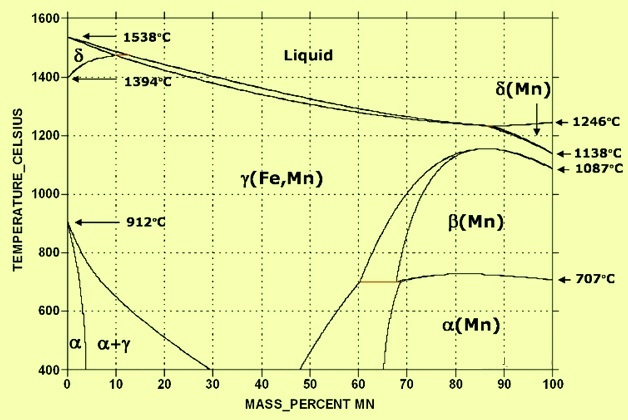 Melting point of Mn is 1244 deg C and boiling point is 2095 deg C. The phase diagram of the Fe-Mn binary system is at Fig 1. Mn is present in most commercially made steels. Mn plays a key role in steel because of its two important properties namely (i) its ability to combine with sulphur (S), and (ii) its powerful deoxidation capacity. Mn is undoubtedly the most prevalent alloying agent in steels, after carbon (C). Mn is intentionally present in many grades of steel and is a residual constituent of virtually all others. Mn has played a key role in the development of various steel making processes and its continuing importance is indicated by the fact that about 85 % to 90 % of all Mn consumed in the world annually goes into iron and steel making as well as in steel as an alloying element. No satisfactory substitute for Mn in steel has been identified which combines its relatively low price with outstanding technical benefits. Mn is used in steel industry in an extensive variety of product forms. These can be classified into three major groups namely (i) ferro-manganese (Fe-Mn), (ii) silico-manganese (Si-Mn), and (iii) Mn ore. There are several standard grades within each group. Fe-Mn and Si-Mn are used mainly during steel making while Mn ore is mainly used in iron making. Types of Fe-Mn and Si-Mn produced are given in article having link http://ispatguru.com/717/. High density Mn containing 96 % or 97 % Mn, depending on grade and Iron (Fe) as the principal impurity, is also used as a desirable addition agent for super alloys, stainless steels, and low C, nitrogen (N) strengthened HSLA (high strength low alloy) steels. Mn additions in form of ferro alloys are usually made in the steel teeming ladle during the liquid steel tapping from the steel making furnace. The efficiency of any Mn addition depends on the steel’s oxygen (O) and S contents. Bath temperature is important not only as it affects the C and O balance, but also in relation to chill factors, especially when large Mn additions are made. Further addition of stronger deoxidizers than Mn such as aluminum (Al) or silicon (Si) can cause reversion of Mn from slag to metal. All other factors considered, however, Mn addition agents are generally chosen on the basis of C content. Standard high carbon Fe-Mn is used when the steel is well oxidized (low in C) or when higher residual C contents are allowable. As maximum steel carbons become more restricted it is necessary to switch to the more costly low-or medium carbon Fe-Mn. The normal Mn content of the different type of steels is as follows. Plain carbon steels – The usual Mn content in the plain carbon steels ranges from 0.05 % to 1.65 %. Alloy steels – In alloy steels, HSLA steels, and tool steels, the Mn content is in the range of 0.05 % to 2.1 %. Austenitic manganese steels – These steels are also known as Hadfield steels and contain 10 % to 15 % of Mn. Stainless steels – Mn content in stainless steels can vary from 0 % to 19 %. Mn is used as a substitute for nickel (Ni) in some grades under 200 series of austenitic stainless steels. Mn improves hot workability by preventing the formation of low melting iron sulfide (FeS). Steels with a Mn/S ratio of at least 8/1 do not exhibit hot shortness. Manganese sulphide (MnS), which forms preferentially to FeS, has a high melting point and appears as discrete and randomly distributed globules. Although solid at hot working temperatures, the MnS inclusions are soft enough to deform into elongated stringers during rolling or forging. Their presence may be harmful or beneficial, depending on the product form and its application. MnS is necessary in any steel that must be machined since it is an effective chip breaker. Also since MnS counters the brittleness from S, it is beneficial to the surface finish of C steel. The shape and orientation of MnS inclusions after hot working, along with that of other nonmetallic inclusions, gives the steel a characteristic texture (anisotropic microstructure). The elongated MnS inclusions are having different effective area when loaded along different axes. This results in anisotropy of monotonic properties as reflected in directional ductility and impact properties. Where these properties are not critical, MnS is essentially harmless. Mn has a negligible solid solution strengthening effect in austenite and only a moderate effect in ferrite. Mn increases strength and toughness after rolling by lowering the austenite decomposition temperature during cooling to give ferritic grain refinement and a reduction in grain size. Mn increases the work hardening rate in austenite and actually reduces work hardening (through enhancement of dislocation cross slip) in ferrite, at least at ordinary concentrations. Since Mn increases steels resistance to deformation, Mn steels are stiffer during rolling or forging. Mn improves the response of steel to quenching by its effect on the transformation temperature. Mn is also weak carbide former. Both properties are advantageous in heat treated steels. Another important property of Mn is its ability to stabilize the austenite in steel, as is done by Ni. Since Mn is not as powerful as Ni in its ability to stabilize austenite, more Mn is required to achieve the same effect. However, Mn has the advantage of being much less expensive. The effect of Mn in forming austenite can be reinforced by combining it with nitrogen (N), which is also an austenite forming element. Mn also increases hardenability rate, used to significant advantage, depending on the steel type and the end product, to improve mechanical properties. The effect of increase in hardenability and tensile strength of steel by Mn is lesser than C. Mn is also able to decrease the critical cooling rate during hardening, thus increasing the steels hardenability much more efficient than any other alloying elements. Mn also tends to increase the rate of C penetration during carburizing and acts as a mild deoxidizing agent. However when too high C and too high Mn accompany each other, embrittlement sets in. For welding purposes, the ratio of Mn to S should be at least 10 to 1. Mn content of less than 0.30 % may promote internal porosity and cracking in the weld bead, cracking can also result if the Mn content is over 0.80 %. Steel with low Mn/S ratio may contain S in the form of FeS, which can cause cracking (a ‘hot-short’ condition) in the weld. Mn also improves wear resistance in steels. Mn slightly increases the strength of ferrite, and also increases the hardness penetration of steel in the quench by decreasing the critical quenching speed. This also makes the steel more stable in the quench. Steels with Mn can be quenched in oil rather than water, and therefore are less susceptible to cracking because of a reduction in the shock of quenching. Mn plays an important role as it lowers the temperature at which austenite transforms into ferrite, thus avoiding cementite precipitation at ferrite grain boundaries, and by refining the resulting pearlitic structures. The strength and toughness of steel depend, first of all, on the grain size and the volume fraction of pearlite contained. Alloying elements, including Mn, also contribute some solution-hardening of the ferrite, but this effect is limited compared to that of C, N, P (phosphorus), and even Si. When the cooling process is accelerated by quenching, austenite transforms into structures with high strength such as bainite and martensite. Mn very strongly retards the transformation of austenite and therefore promotes deep hardening in heat treatable steels. Mn also lowers the transformation temperature and the eutectoid C content. These properties account for the wide use of Mn in steels in which transformation must be controlled. Mn lowers the ‘Ms’ temperature and high Mn steels tends to contain residual austenite. Because it is very cost effective hardenability intensifier, Mn is present in all standard heat treatable steels. Mn is specified in these steels in the range upto 1 %. However, Mn is also important in flat rolled steels. The lower transformation temperature produced by Mn addition promotes finer grain sizes, either as-rolled or normalized. As grain size is reduced (either of ferrite, bainite, or pearlite) yield strength increases and impact properties improve. As an added benefit, pearlite content increases with increasing Mn concentration for a given C content. This raises strength, without sacrificing weldability. Depending on which carbon equivalent formula is applicable for the steel in question, Mn is only 1/6 to 1/20 as detrimental to weldability as carbon itself. Although Mn forms carbide that is similar to cementite, it produces no secondary hardening during tempering. Mn does enhance susceptibility to temper embrittlement when present in excess of 0.30 % and care should be taken to avoid the critical temperature range (375-575 deg C) during tempering. Heavy sections should be quenched from the tempering temperature, if it is above this range. Besides the heat treatable steels, Mn is present in a wide variety of steels, for an equally wide variety of reasons. Flat rolled carbon and HSLA steels contain up to 2 % Mn for microstructural refinement and resulting improved mechanical properties. Mn may be substituted for part of the Ni content in austenitic stainless steels (200 series). Such steels gained importance during times of critical Ni shortage. They contain Mn in the range of 5.5 % to 10 %. One of the earliest, and most interesting, types of alloy steels contains 10 to 15 % Mn and 1.0 to 1.4 % C. These are the Hadfield steels, which were originally developed before the 1900’s. When quenched from above 1000 deg C, these steels remain fully austenitic at room temperature. Their utility is based on their extremely high work hardening rate, which makes them useful as, for example, earthmoving and mining equipment components. When the surface of a Hadfield’s steel is deformed it becomes very hard, resisting further deformation. The underlying metal, however, remains soft and ductile. Carburizing steels contain up to about 1.0 % Mn, but considerably less may be present in certain grades. Nitriding steels contain typically 0.55 % Mn, but the range within the several commercial grades extends from residual traces to almost 1.0 % Mn. Mn does form a nitride, but its use in these steels is mainly based on heat treatment (hardenability) effects. Similarly, tool and die steels rely on Mn for deep hardening. This is important when high concentrations of strong carbide formers are present, as these can withdraw carbon from solid solution, thereby reducing hardenability.